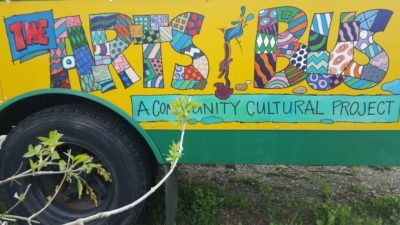 The Arts Bus was conceived in 2008 by a group of parents, cultural leaders, and public school principals and teachers from Braintree and Randolph as a response to the continuing need of children to have consistent and meaningful exposure to the arts. The members of the group all shared a strong conviction that learning through the arts and living with the arts should not be peripheral but basic in the educating process, and that a continuing proximity to the arts accelerates healthy development during early childhood and serves people through every subsequent stage of life, profoundly affecting human function, sensitivity and fulfillment. Back in 2008, knowing that the deepening financial pressure on small rural schools was making it difficult for the schools to provide the kind of arts education children need and deserve, our little citizens’ coalition wanted to help the schools supplement their curriculum. We were also aware of a nagging transportation problem faced by young people and their families in rural America. Many parents (particularly in single-parent households or in households where two parents both work full-time jobs) are unable to drive children to enrichment activities at distant sites. So, we thought, why not bring creative experiences to them? A retired school bus driver donated his bus to us in memory of his wife, a music teacher, and, we were ready to go. Or so we thought. It ended up taking us almost a year to make our bus roadworthy and to raise the funds needed to bring programs to the kids. Raring to get the vehicle outfitted and on the road, we targeted the 2009 Randolph July 4th parade for the public debut of the Arts Bus. Then we set to work looking for skilled volunteers to transformthe ugly duckling into a swan. We were encouraged to find community groups and individuals stepping forward to help. The automotive students at Vermont Technical College (VTC) did a detailed condition assessment, described the extent of the overhaul that would be needed and listed the parts that would have to be replaced. Students from the Norwich University Architecture Department made the bus a class design project and came up with 21 approaches to reconstructing the interior as a multi-use space. The noted stained-glass artist and cartoonist Phil Godenschwager, a Randolph resident, designed a wrap-around mural for the exterior of the bus, and supervised a tag team of local artists and high school students in painting it. 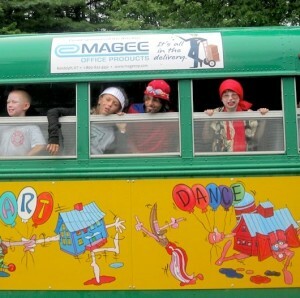 And area merchants started contributing needed supplies and materials.The vehicle’s mechanical issues were more challenging than expected, and on July 4th, instead of leading the parade in Randolph, the bus was slowly wending its way over a mountain, coughing and sputtering, to a local garage. There it spent months getting its engine re-built and its body rehabilitated after many years on the rough back roads of Vermont. With the talents of the VTC automotive department, a local mechanic and community volunteers, an extensive engine and body reclamation was competed over the year. And from this labor, the swan has emerged — complete with interior restaurant booths rescued from a local eatery, and recycled counters for drawing, painting and a variety of on-board projects. A “free book” nook, storage bins for art supplies and musical instruments, and a theatrical stage at the back of the bus (built from a handicap access lift platform), have been installed. The Arts Bus finally had its debut in the pouring rain on Saturday, May 8, 2010 at the Fiddlehead Festival in Randolph, an annual celebration of the growing season. The bus chugged up Route 66, and when it arrived at its assigned place on the VTC site near the Border Collie sheep herding demonstration, there was no ribbon-cutting ceremony and there were no fancy speeches. The rain saw to that. When the door of the bus opened Cynthia Sandusky, the project director, was handed a dripping daffodil of welcome and the Project was officially launched. The Arts Bus team formed up for the parade and the vehicle took its place at the very end of the line of tractors and four-legged critters, and proudly passed the reviewing stand as the featured new kid on the block. An unruly crowd of at least 30 cheered. Then Rev. Kathy Eddy blessed the tractors and came over and sprinkled an ample amount of holy water on the bus, as if any more was needed. Cynthia and her husband Eddie Freund set up a reading tent outside the bus and stocked it with books and little chairs. Inside the Arts Bus the day’s program was a great success. Barry Miller, the featured artist of the day, had loaded the back space with many bongo drums, shakers and other percussion instruments, and led a continuing drumming circle. Cynthia taught kids how to make Chilean rainmaking sticks — important for crops in dry climates, but hardly necessary on a wet Vermont day in May — but a great activity nonetheless. The interior of the bus, the tables, the long counter, and the open space in the back, worked perfectly. The two separate activities held their own: the little rainmaker-makers grooved to the rhythm of the drumming as they put their projects together. Children flowed in and out at a steady pace through the afternoon. According to the ebullient director: “Reception to the Arts Bus was so great, that at times during the day we could not have packed more people in. Everyone seemed to have a spectacular time.” A mood of levity and hospitality prevailed. The first day of the Arts Bus was a delight. 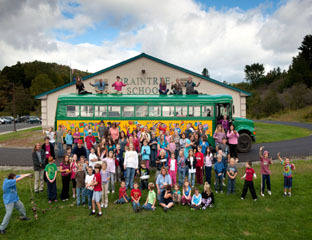 The Arts Bus is now a fixture of instant fun art education in Vermont. It is in high demand from elementary schools, in-home child cares, preschools, libraries, after-school programs, recreation departments, summer day camps, mobile home and subsidized housing communities to bring art, drama, and music to their neighborhoods and facilities. The Arts Bus routinely provides over 2,000 children each year with opportunities to explore their own innate creativity, irrespective of economic means or geographic proximity to an arts center. Between April and November each year, the bus targets over 100 stops in 10 towns in central Vermont (Bethel, Braintree, Brookfield, Chelsea, Randolph, Rochester, South Royalton, Stockbridge, Tunbridge and Williamstown). We offer our Creativity Workshops for child care providers, parents, and K-12 teachers. 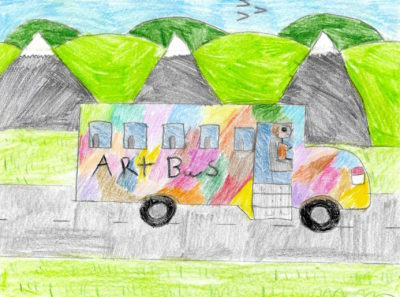 In 2013, in collaboration with the Vermont Chapter of the American Academy of Pediatrics, the Arts Bus published a book based on the Irene Arts Unit work, entitled Children, Trauma, and the Arts. In 2019, we have new board members, staff, artists, and road ahead. Stay tuned as we make more history!